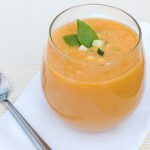 A refreshing homemade peach gazpacho recipe as well as a KitchenAid Blender review. I received a free blender from KitchenAid to review, but was not financially compensated for writing this post. Between the power outages and website upgrades, it has been a hectic few weeks. 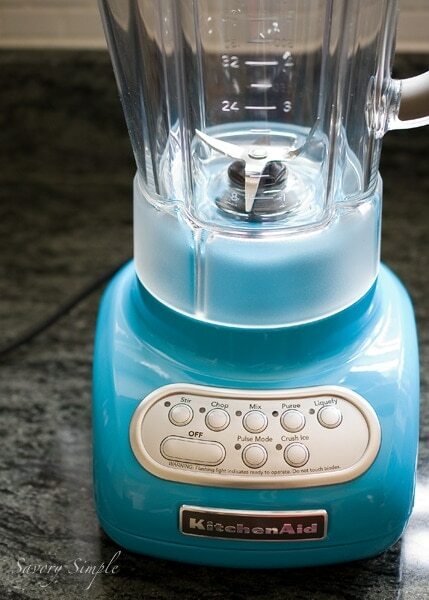 So you can imagine my delight when I received a gift in the mail from KitchenAid: their new Crystal Blue 5 Speed Blender. Everything about this machine is gorgeous. Crystal Blue is one of their latest colors and I’m tempted to redesign my entire kitchen around it. But the real question is how does it work? I decided to test the blender with a recipe I’ve been developing for peach gazpacho. Peaches are in their prime right now and after the blistering summer temperatures we’ve experienced, I’m inclined to leave the oven turned off whenever possible. The key to this recipe is ripe peaches, preferably from the farmer’s market. The quality of your peaches will take this recipe to extraordinary heights or leave you wondering why your soup is so bland. Trust me, I’ve made it several times with varied results. You’re never going to get the same quality of produce at the grocery store as you will from a local roadside stand or market. Flavor is everything in a good recipe. Many recipes will have you blanch the peaches in hot water to remove the skins. This actually isn’t necessary if your peaches are very ripe. If you don’t mind getting a bit sticky, I’ve developed what I call the Twist and Squeeze™ method. Cut the peaches in half from top to bottom. With very clean hands, hold each peach over the blender and twist apart. Squeeze both sides very well. All of the pulp and juice will go straight into the blender (make sure the pit stays with you). If this doesn’t work, your peaches aren’t ripe enough! Discard the skins. Much faster than blanching, I say. How did the blender work, you ask? Like a dream. I used the Puree button to turn my peaches into a silky nectar. I then used the Chop button on Pulse Mode to cut up my cucumbers. I prefer my gazpachos to be mostly smooth, but you can adapt this recipe to suit your preferences. You can actually just throw all of the ingredients together in the blender and chop or mix until you get the desired consistency. I have one optional “secret” ingredient in this recipe. You don’t need to run out and buy some but it does take the soup to the next level. 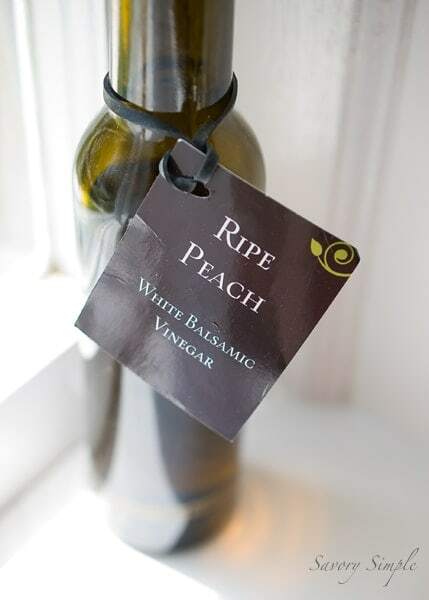 I’m speaking of ripe peach vinegar. I found this wonderful vinegar at a specialty shop in Frederick, MD called Lebherz Oil & Vinegar Emporium. You can order from them online or look for a similar shop in your area. Many specialty shops carry flavored vinegar. 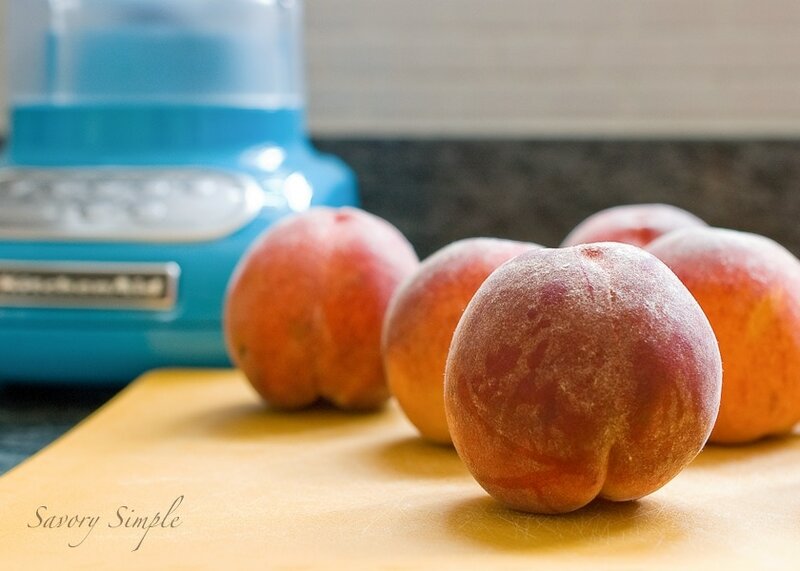 A refreshing homemade peach gazpacho recipe as well as a KitchenAid Blender review. Puree the pulp and juice of the peaches (excluding the skin) in a blender until smooth. Stir in the additional ingredients by hand. Before serving, garnish each bowl with some diced cucumber, shallot and basil. Disclaimer: I received this KitchenAid Blender for free. I did not receive any payment and all opinions expressed in this post are my own. Gosh, I can’t stop starring at your Crystal Blue beauty! Just gorgeous…. Your peach gazpacho sounds great. As a big fan of peaches I would love to try this recipe. Woah! A peach gazpacho?! That sounds incredibly delicious!! And your pictures are just amazing! Beeeeeautiful gazpacho! And oh my – that blue is one of my favorite blue shade! SUPER CUTE!!! Oh you are so lucky Jen!! Looks very refreshing, thanks for sharing! 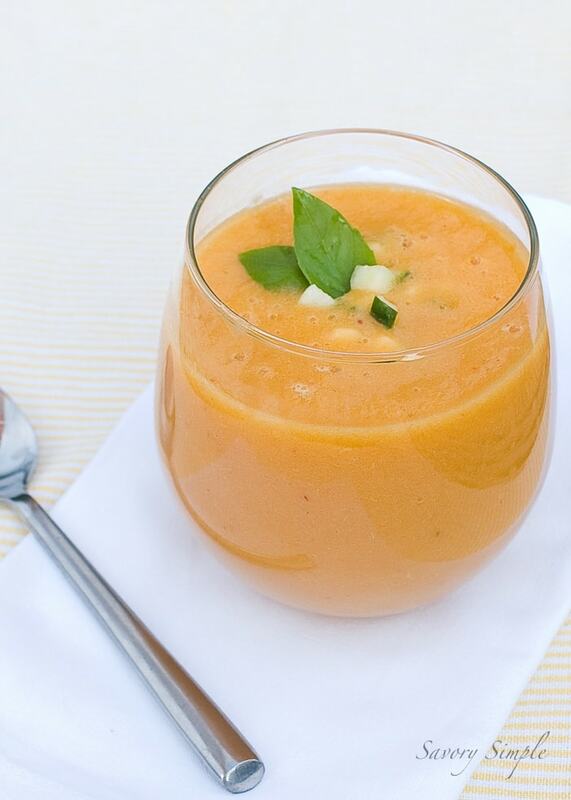 This gazpacho looks beautiful and I’m in love with the blender color! LOVE it! I am in need of a new blender… badly! LOVE that blender – that color, OMG so gorgeous and retro-ish! And the recipe, too….summertime never looked so good! I’m not sure which I prefer the recipe or the blender or both! That’s decided I love both! 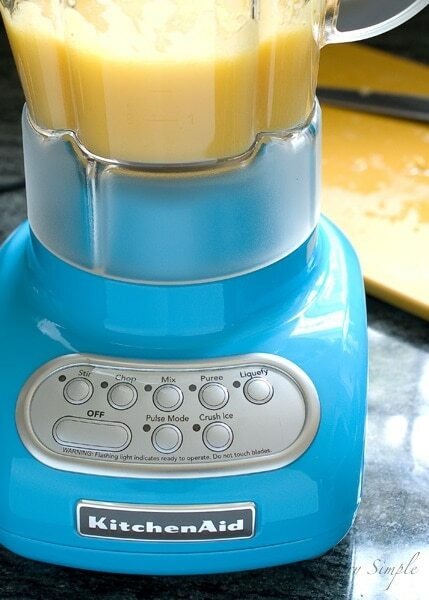 Looks like sth I should try :) and the blender has an amazing color. I’m stalking your gazpacho recipes because I’m hosting a bridal shower next week and I already have two tomatoey items…but I want gazpacho shooters. This one looks like it would be great! Could this be made ahead one or two days if left sealed and cold? How do you receive free Kitchen Aide appliances? 1.) Start a food blog. 2.) Ask them if you can review a product on your blog. I wind up not even trying these recipes. It doesn’t list the vinegar to use if I came home with a big bag of peaches, remembering the recipe, then finding no substitution listed for the “secret ingredient”. That’s because you don’t need to substitute anything in it’s place… you either add it or you don’t. But thanks for the sweet comment.